Here are three ideas that I hope every one of you has taken away from this blog. The idea is to empower you to make money trading. Without giving away all my secrets, I have shown you the path to profitability in three areas, leaving it to you embark upon your own individual journeys. I've tried to mix theory with practical, realism with hope and the technical with fundamental. So let us review, as these topics will be on your final exams, so be ready, be prepared and be forewarned. (1) The Trade Triangles from Market Club (click on their advertisement somewhere around my photo) are an objective, mechanical way to trade short-term breakouts in indexes, stocks and futures. I tried to put up enough examples to prove that the concept works and that you can tweak the trading rules to fit your own trading style and emotional temperament. (2) NanoViricides is our own lottery ticket to wealth. With much greater odds then the Powerball payoffs, this gem of a company has eight potential NDA's and an evolving pipeline that soon will be the envy of the entire biotechnology sector. It's selling at sixty-five frigging cents a share today. If only a couple of their products pan out, it's a $50 stock. Half the products, a $100 stock. All their products, $200. Their progress in the lab has been phenomenal. So why is it still a penny stock? Because their story is too good to be true. The bet here is that it is true. Every development, press release and periodic report to shareholders has been consistent with the claims being made. The time-line is a drag and the impatient have moved on. Those of us left standing with these shares will one day soon toast to them, to the bashers and to the unwashed detractors who have tried to loosen the grip of true believers on their shares from day one. It will be the most satisfying toast of our lives. 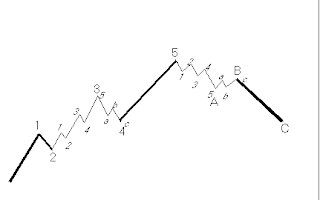 (3) The Crash introduced the concept of pattern recognition to our trading, specifically the eight wave fractal described in The Elliott Wave Principle. 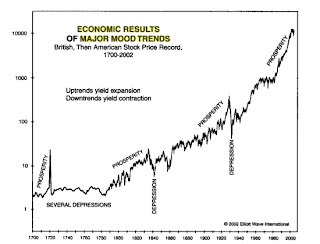 It has taught us that social mood drives society and our economy and that although invisible to the naked eye, social mood is manifested in the movement of the stock market, the collective psychology of society. These patterns can be measured in an empirical fashion through the use of Elliott Waves. Because these patterns can be identified and measured, because they are consistent, they are predictable. Because they are predictable, they can be an effective tool to wager on probabilities in the market. The markets are on the precipice of another big move. It's not up. This little Wave 4 is playing out and when its done, Wave 5 to new lows will begin. The Dow will lose a couple thousand points. Be ready, be prepared and be forewarned. NanoViricides filed their Annual Report today. I am reproducing the most relevant information stated in the Report (emphasis in bold added). This Summary is meant to be only a cursory overview of progress in the development of a product pipeline and is in no means a substitute of reading the entire Report. On December 23, 2005, the Company signed a Memorandum of Understanding (MOU) with the National Institute of Hygiene and Epidemiology in Hanoi (NIHE), a unit of the Vietnamese Government's Ministry of Health. This Memorandum of Understanding calls for cooperation in the development and testing of certain nanoviricides. The parties agreed that NanoViricides will retain all intellectual property rights with respect to any resulting product and that the initial target would be the development of drugs against H5N1 (avian influenza). NIHE thereafter requested that we develop a drug for rabies, a request to which we agreed. The initial phase of this agreement called first for laboratory testing, followed by animal testing of several drug candidates developed by the Company. Preliminary laboratory testing of FluCide(TM)-I, AviFluCide-I(TM) and AviFluCide-HP(TM) were successfully performed at the laboratories of the National Institute of Hygiene and Epidemiology in Hanoi (NIHE), against both clade 1 and clade 2 of H5N1 virus isolated in Vietnam. Successful animal testing of RabiCide-I(TM), the company's rabies drug, was performed in Vietnam during the first half of 2007, and reproducibly repeated in 2008. Rabies testing can safely be done at their BSL2 facility. The H5N1 animal testing requires a BSL3 (biological safety laboratory level 3) laboratory. NIHE has acquired a BSL3 animal testing capacity during 2008. The work with NIHE will likely continue through calendar year 2009. While the MOU provides for a final agreement between the Company and NIHE, we have not yet discussed a "final agreement" with NIHE and continue to work under the existing MOU. There are no financial obligations or responsibilities for either the Company or NIHE pursuant to the provisions of the MOU. We have finalized execution of a Materials Cooperative Research and Development Agreement (M-CRADA) with the Centers for Disease Control and Prevention (CDC), Atlanta, GA in July, 2008. This agreement was initiated based on our success against Rabies in the animal studies conducted at NIHE Vietnam. Preliminary animal studies against Rabies are expected to start in the last quarter of calendar year 2008 or first quarter of calendar year 2009. Subsequent to the agreement execution, the Company has supplied certain materials to CDC for testing. This testing, if successful, is expected to expand to involve potential use of nanoviricides as (1) a post-infection therapeutic drug against rabies, possibly in conjunction with a rabies vaccine, and (2) a post-exposure prophylactic drug against rabies, to replace costly human or monoclonal antibodies, possibly in conjunction with a rabies vaccine. To date, there is no effective post-infection therapeutic against rabies. Post-exposure prophylaxis market has been estimated to be as much $300M to $500M worldwide. We have finalized a CRADA with Walter Reed Army Institutes of Research (WRAIR) to develop collaboratively antiviral agents against all four types of dengue viruses in April, 2007. Preliminary work has commenced under this CRADA. This CRADA is expected to be renegotiated due to changes in funding requirements at WRAIR. We have finalized a Materials Transfer Agreement (MTA) with the United States Army Institute of Infectious Diseases (USAMRIID) to develop antiviral agents against Ebola, Marburg and other hemorrhagic viruses in October 2007. Preliminary studies began in February, 2008. Certain nanoviricides candidates were found to be highly successful against Ebola virus in pre-clinical cell culture studies. Ebola virus is known to produce, in vivo, a soluble decoy protein that is a portion of its surface glycoprotein. If the nanoviricides that were successful in the in vitro studies bind to the decoy protein portion of the Ebola virus envelope, then we would expect that the nanoviricides would be neutralized in vivo by the decoy protein. We are therefore developing novel ligands that would potentially bind to the Ebola virus glycoprotein portion that is known to be not a part of the decoy protein. The MTA was extended for another year in October, 2008 to continue these studies. We have finalized a CRADA with Armed Forces Institute of Pathology (AFIP) to perform animal studies against H5N1 in March, 2008. The animal protocols are in review for final approval by their animal care committee. We have finalized an agreement with a major Medical Institute to perform animal studies of our eye drop formulation of nanoviricides against viral EKC (viral Epidemic Kerato-conjunctivitis) in March, 2008. The first EKC-Cide(TM)-I animal study was completed in June, 2008. Biochemical testing of the samples is continuing. The study indicated that the best nanoviricide drug candidate showed excellent clearance of clinical signs of the disease, viz. redness of the eye as well as sticky exudates, in a short time after treatment. We have received significant interest from certain Pharmaceutical companies in this drug candidate. We have a continuing job-based subcontract relationship with KARD Scientific, Inc., Beverly, MA. KARD Scientific is owned and operated by Dr. Krishna Menon, who also serves as Chief Regulatory Officer to NanoViricides, Inc. in a consulting capacity. KARD Scientific has performed repeated studies of nanoviricides against common influenza. KARD Scientific also conducted certain efficacy studies of nanoviricides drug candidates against HIV in SCID-hu/Thy/Liv mouse model beginning in March, 2008. The results from this study are being compiled. Significantly, the best nanoviricide drug candidate showed viral load reduction that was superior to that of animals treated with the oral HAART 3-drug cocktail. This drug candidate also showed superior survival of mice as compared to those given the standard cocktail. If these preliminary results continue to hold in further studies, and later in humans, the Company believes that, either alone or conjunction with existing anti-HIV drugs, it should be possible to develop a "Functional Cure" for HIV/AIDS as defined by NIAID, using our anti-HIV nanoviricides. Our belief is based on the excellent efficacy profile of these drug candidates, their excellent safety profile, and the understanding that the mechanism of nanoviricide action is complementary to that of the other anti-HIV drugs. Management believes that it has achieved significant milestones in the development of a number of antiviral nanoviricide drug candidates. We now have high efficacy lead drug candidates against (1) common Influenza (FluCide-I), (2) all High Path Avian Influenzas including H5N1 (FluCide-HP), (3) Rabies (RabieCide-I), (4) viral EKC (EKCCide-I), and (5) HIV (HIVCide-I). In addition, the Company has also established the technology feasibility for (a) broad-spectrum nanoviricides, and (b) Just-in-Time ADIF technology; both of which are well suited for stockpiling to defend against known as well as novel infectious diseases. Essentially, the dynamic nature of today's rally is consistent with every other spike rally in this Bear market. Each has led to an excellent place to sell your stocks and go short the major indexes. For the next couple of weeks (through November 10), Elliott Wave International is offering a DVD teaching set based on The Elliott Wave Principle and taught by Robert Prechter himself, for a discounted price of $39 (reduced from $129), when purchased through web sites of EWI Affiliates. I just ordered a copy for myself and based on prior works by Prechter, I can highly recommend this for anyone wanting to add Elliott Wave analysis to their trading arsenal. As the above chart indicates, not much has changed. The Stanley Cup Champion Detroit Red Wings remain the class of the NHL and I am expecting the market to make new lows this coming week. As far as the World Series goes, I cannot name a single player on either team, even though Game 4 is on my TV about 10 feet away. But it gets worse, if I didn't have the TV tuned to the channel, I wouldn't know which two teams were playing. From the annoying sound of the crowd, it clear that a team from the obnoxious Northeast corridor is playing (and probably winning). Speaking of which, the Michigan Wolverines lost to Michigan State yesterday, like for the first time ever (or so it seems). Gives East Lansing something to keep it warm this winter above it's God-forsaken frozen tundra of a college town. Don't forget to turn your clocks back this weekend, or is it next weekend? Arizona doesn't participate in daylight savings time, yet I still don't get the clock thing right. I didn't know you could opt out of it, anyway. How do you do that, do you write a letter to the President saying your state is not going along with it? Didn't the South try that once? Oh yea, Californication is on tonight. The highlight of my week. That should do it, except for this: I saw Joni Mitchell perform in a little coffee house in Ann Arbor in 1968. After her second set, I went back stage to meet her. Fragile, beautiful, young and so appreciative of this college boy telling her how wonderful she was. That was the Joni Mitchell in the video, unequivocal talent and grace. For some long-term perspective, today's chart illustrates the Dow adjusted for inflation since 1925. There are several points of interest. For one, when adjusted for inflation, the bear market that concluded in the early 1980s was almost as severe as the one that concluded in the early 1930s. Also, the inflation-adjusted Dow is now less than double where it was in 1929 and trades a mere 29% above its 1966 peak. 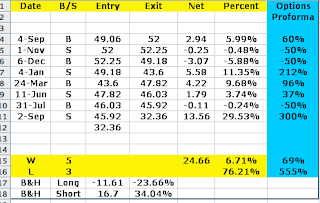 Not that spectacular of a performance considering the time frames involved. However, the magnitude of the bull market of 1982 to 1999 (even when adjusted for inflation) was truly of historic proportions. It is also interesting to note that the magnitude of the current bear market (when adjusted for inflation) is greater than what occurred during the dot-com bust of 1999 to 2003. As a result, the Dow currently trades at 12-year lows. Cash is what Buffett calls, "a terrible long term asset, one that pays virtually nothing and is certain to depreciate in value." Except for the past eight years? Except in Bear Markets? Except in Grand Supercycle Bear Markets? Then he insults The Great One by suggesting that buying falling stocks blindly is akin to prescience on the ice. Prices are coming down across all markets. A comment in the previous blog asked me, "if I was nibbling on anything long here." I don't nibble. Nor do I buy stocks, gold, oil, corn, or anything in free fall. Triangle Trading from Market Club is holding Short here. Elliott Wave structure requires a new low in the DJI (for this move) before any tradable rally can be identified. As for the slandered Gretsky, I shall apologize to Wayne personally, or at least through his actress wife, Janet Jones: That is as soon as I spot where she sits at the games. These are some clues, if anyone catches a Phoenix game locally. No, I'm not talking about the kind of depression that comes from getting kicked in the side of your head by an old girlfriend. This kind is an economic depression, brought about by, well, by what? How about social mood? Here is a chart reproduced from Google's Preview of Robert Prechter's 2002 treatise, Conquer the Crash. "Major stock market declines lead to lead directly to depressions. Figure 2-1 [above] displays the entire available history of aggregate English and American stock price records, which go back over 300 years. It shows that depression has accompanied every stock market decline that is deep enough to stand out on the long term graph. There are three such declines, which occurred from 1700 to 1784, 1835 to 1842 and 1929 to 1932." Notice how the 1987 stock market crash does not stand out on this chart. Unlike the wise counsel of Warren Buffett and the CNBC cheerleaders, this is no 1987 whereby the sooner one bought back into the market, the better the ultimate profits gleaned from the fervent bull market of the 1990's. Back in the late 1970's I was a wet behind the ears attorney in Atlanta with a strong addiction to the stock market. It wasn't long before I discovered another young addict, Robert Prechter, just up the road in Gainesville, Ga. He was my first (of many) market gurus, introducing me to a novel form of technical analysis deemed, The Elliott Wave Principle. Using Prechter's book and his thrice a week telephone updates, I made my first small fortune in the stock market. did I return to the fold, this time not so much as a way to trade stocks, but as a way to understand life, society and economics. As I read over the Internet this Saturday in October, 2008, I can't help but be amused by the near total obsession with getting in the market at "the lows" "the bottom" "the turn of the screw". By order of no one else but the Emperor Warren himself, the market has been commanded to stop it's decline and soar to new heights. 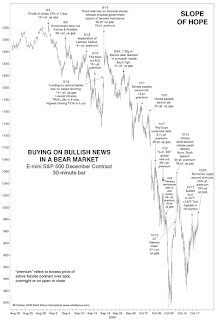 Everyone is pointing to previous lows in the great bull market of the 20th century as their example from which they are taking their current marching orders. In the likely face of an economic depression, I don't think so. "Stocks are not registering a Supercycle top like that of 1929 but a Grand Supercycle top....That means that the ultimate---if not the immediate---consequences will be more severe and more confounding than the consequences of the 1929-32 crash. As Chapter 5 of At The Crest of the Tidal Wave explains, the entirety of the Grand Supercycle wave IV should last a century and comprise two or three major bear markets with one or two intervening bull markets." --Conquer the Crash, Robert R. Precther, Jr. The line it is drawn The curse it is cast The slow one now Will later be fast As the present now Will later be past The order is Rapidly fadin'. And the first one now Will later be last For the times they are a-changin'. By now you know that Warren Buffett is buying the market here, as per is his Majesty's missive published this morning. Great long term strategy, for a bull market. Neither Buffett nor any one of us alive today has lived through a Grand Supercycle Bear Market, the likes of which we are encountering today. By his own measurement of success, stocks will be higher in 10 years, something that even I do not discount. But I would rather enter my positions closer to the lows, which are likely to be significantly lower and months, if not years from now. What will change my mind? Prices. Just as they took me out, they will get me back in. Whether lower or higher from current levels, I don't care. As long as I stick to what got me this far, it will be the right thing to do. Buffett's Berkshire Hathaway is down about 25% year-to date. This puts Buffett in the ranks of market performers. Yet the world swoons when he talks about stocks. I guess that is better then Cramer, but still, a guy who does no better then the average index fund isn't exactly the kind of market guru that appeals to me. 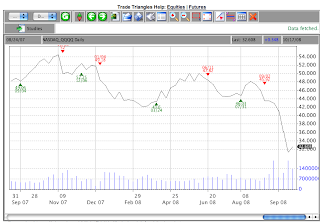 Note that for the past twelve months, without leverage, the Triangles are +76.21%. 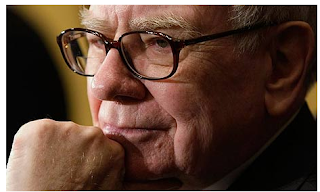 During the same time frame, Buffett's Berkshire Hathaway has dropped from approximately $120,000 to it's current $113,150, a decline of approximately 6%. Doth the Emperor be in need of some clothing? As I occasionally do, I send out PUBLIC Notices of BIG market events on the horizon. Earlier today, ALL of our NEoWave Trading customers Shorted the S&P near the highs (around 1040 and 1019 in the Dec. Futures). Based on current, short-term wave structure, the S&P is now at risk of its LARGEST, FASTEST, MOST VIOLENT DECLINE IN HISTORY!!! PLEASE protect yourself and don't get caught in the "bargain hunting, and the market is bottoming," mentality. I missed the largest rally in stock market history. With all your eyes looking to me for guidance in these turbulent times, I remained alarmist and resistant to admitting the market was in bullish mode, due to my stubborn refusal to see what was unfolding before us all. Raise your hands if you believe that crap. Yes, it is all true, but there is a method behind my madness. HEALTHY MARKETS DO NOT RISE 11.5% IN A SINGLE SESSION. I have been alerted to an Elliott Wave count that has extremely bearish potential for the next two weeks. Monday's rally and even some carry over rally into Tuesday is consistent with a fall-off-the-cliff decline before Halloween. You may lower your hands now. Probabilities favor at a minimum a retest of last week's lows. Possibilities include the incredulous, that the "Crash" first mentioned here on September 10, 2008, has yet to hit. Instead, it is just ahead and if the past few weeks are any indication, it will take no prisoners. Right or wrong, that's tonight's road map. Be careful out there. This article in today's Washington Post might very well portend what is coming next in the market's road to a Wave C low. Warning - it isn't pretty. The Next World War? It Could Be Financial. "The global financial outlook grows more dire by the day: The United States has been forced to shore up Wall Street, and European governments are bailing out numerous commercial banks. Even more alarmingly, the government of Iceland is presiding over a massive default by all the country's major banks. This troubling development points not only to an even more painful recession than anticipated, but also to the urgent need for international coordination to avoid something worse: all-out financial warfare." "Declining C Waves are usually devastating in their destruction. They are third waves and have most of the properties of third waves. 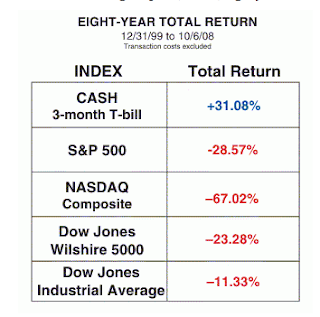 It is during these declines that there is virtually no place to hide except cash. The illusions held throughout waves A and B tend to evaporate and fear takes over. C waves are persistent and broad. 1930-32 was a C wave. 1962 was a C wave. 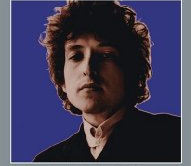 1969-70 and 1973-74 can be classified as C waves." Remember that this C wave is one fractal higher then any of the C waves described above. Meaning that my all standards of measurement, it will be a degree higher, i.e. worse point decline, worse percentage decline, worse log scale decline, it fact, it should be the worse decline in the lifetime of any market participant, since the last decline of this magnitude was in the 19th Century. Keep in mind that the stock market races ahead of the underlying fundamentals by at least six months. Thus the worse news stories, much worst then what is linked above appearing in today's Washington Post, are still down the road. Also down the road, sadly, is something that accompanies virtually all bear market bottoms: Another war. The market does not travel in a straight line. There will be rallies within the confines of the wave C structure. They will be sharp (like the 1000 point rally in the DJI last Friday), but fleeting. All of them, every one, to be followed by new lows. All probabilities favor the downside, until further notice. I am no longer invincible. And 1400 points in the four trading days since Sunday Night Observations. The market has fallen about 25% since all these blogs of mine started, about the same percentage as the "Crash" of 1987. Enough to qualify as a Crash? Yes, by past standards. But this time it's different. In Elliott Wave terms, this bear market is a generation higher, one larger fractal higher then the 1987 crash. As such, we should expect this crash to be commensurately larger. Don't know. But by the way the market has so effortlessly rejected rallies on the way down, especially this week, I am guessing we have further to go then anyone imagines. That doesn't mean there won't be rallies before the final washout lows are seen. But human psychology being what it is, I suspect those final washout lows will occur at about the time that no one cares anymore. Not much of a road map. But probably better then all those archaic sentiment readings and oversold oscillators left over from the bull markets from whence they came. This time IS different and a new way of looking at the stock market is being born of these miserable times. Miserable, that is, only if you are Long. Have You Reached the "Point of Recognition"? just to the right of this blog. It provides a good road map as to where the market is right now, where it came from and most importantly, where the market is probably going in the days and weeks ahead. Highly recommended reading. The “E” reflects that the Company has not yet filed its Form 10-KSB, annual report to shareholders. The Company’s symbol will return to NNVC.OB once the Form 10-KSB is filed. The Company anticipates it will file our annual report within the time provided and expects there to be no significant change in its financial statements.Commenting on this event, Eugene Seymour, MD, MPH, the Company’s Chief Executive Officer, stated “We want to assure our stockholders that nothing about the Company has changed. We remain committed to both our mission and our science and we will rectify this issue within ten days. Following recently disclosed successful financing, we are now busy scheduling the follow-on studies against HIV as well as adenoviral EKC. 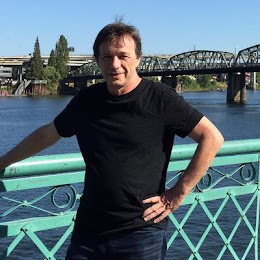 We have received significant interest from several major pharmaceutical companies, as well as governmental and non-profit institutions for nanoviricides development against these diseases,” he further added. “We are now gathering significant and valuable input for these studies from important stakeholders interested in furthering development of highly effective drugs against these major diseases,” said Anil R. Diwan, PhD, President of the Company. As for me, I've been buying NNVC under $1.00 and now under $0.75, adding to my positions. This is a rare opportunity to buy a stock on the cusp of significant company developments with global health ramifications. We have been given hints of substantial HIV progress that has yet to hit the media, but make no mistake, once it does, available shares will dry up as this stock will be bid up above previous all time highs. We can only play probabilities in this game and the probabilities are on the side of a once in an investing lifetime buying opportunity with this stock. It's Sunday night and I've just gone through my charts. My bearish stance of stocks remains in tact, I see no reason not to expect further downside volatility this coming week. In fact the Globex Futures Market is showing the S&P down 20 points, indicating a very weak opening on Monday. Gold in tonight's spot market is down about $4.00. That doesn't sound like much, until you take into consideration the S&P's being so sharply off tonight. The case for gold has a lot to do with the collapse of global financial markets. But if it is indeed a deflationary depression that is asserting itself, gold is destined to decrease in value like every other asset class. What are the signs to look for? Gold not appreciating in line with global stocks depreciating, as in tonight's numbers. Above pattern is a traditional Elliott Wave pattern. Elliott Waves are fractals, so that this pattern is constant whether on a daily, weekly, 60-minute or 1-minute chart. Assume for the purposes of this example that the above is a general sketch of a weekly DJIA chart, starting in the lower left corner with a Wave 1 that commenced at the bottom of the last bear market, circa 2002. My suggestion is that we are currently just past the "B" which was the High made in the Fall of 2007. 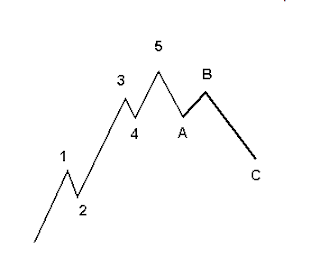 Today's market is about 1/4 of the way from B to C.
This is basically the same chart as above, only the waves 3 and 4 on the left and waves A and B on the right are subdivided. This chart is important to point out that even if the bigger wave is moving in one direction, the sub-divisions of that bigger wave include contra-trend moves. So for example, even though the movement from A to B on the right is in the UP direction, there was a smaller wave, a to b that was down. 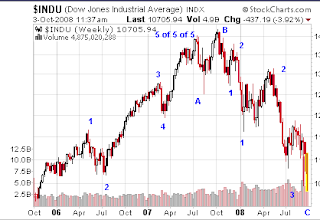 This is my crude hand made DJIA weekly chart showing a completed 5 waves up from the lows on the lower left hand corner of the chart to the multi-year Top in the Fall of 2007, i.e. Wave 5 of 5 of 5. From that Top I've labeled Waves A (down) and B (up) and the beginning of Wave C (down, down, down) via a series of waves 1 and 2. Thus my current analysis is that the market is a Wave 3 down. (Wave 3 of 3 of 3, referenced in a previous blog, refers to the internal subdivision within Wave 3). I have no idea if my count is an accurate portrayal of orthodox Elliott, but it does coincide with both my view of the markets and the upper two charts of orthodox Elliott Waves. This DJIA chart shows the beginning of the drop of wave "C" portrayed in the top two charts. I estimate that the market is about 1/4 of the way from B to C. This also implies that the most powerful part of the drop from B to C still lays ahead of us. C-Wave analysis projects a series of precipitous downward moves in the DJIA, interrupted by sharp but short rallies against the major trend, all of which are followed by steep drops to new lows. At the end of Wave C, expect one hell of a rally. Wave 3 of 3 of 3 Down? Interim Update: I've been looking at charts all morning and the same pattern is emerging: all major equity indexes may very well be in Waves 3 of 3 of 3 Down. Now I do not have time during trading hours to explain, but anyone who read Robert Prechter's Elliott Wave Principle will understand what I am getting at here. If indeed this is what is happening, then it is a rare trading opportunity on the downside. Nothing in trading is a certainty, we can only measure probabilities and act accordingly. The probabilities of a DJI move to 7000-9000 before year's end are growing.